I have been working on some new designs based around those old fashioned postcards from towns popular in the early last century, where there is the overlay of a drawing creating a ‘window’ with the photography of the place behind it. So the idea is to use a ‘picture frame’ of black and white ‘pattern’ with the hand coloured linocut tucked in behind it. 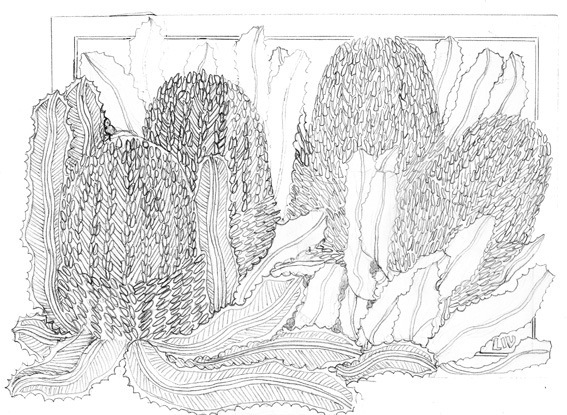 If you follow me on twitter – by clicking the follow button in the left margin or https://twitter.com/#!/LynWeir – you will have been updated as to the progress of the Banksias – Banksia menziesii – design. 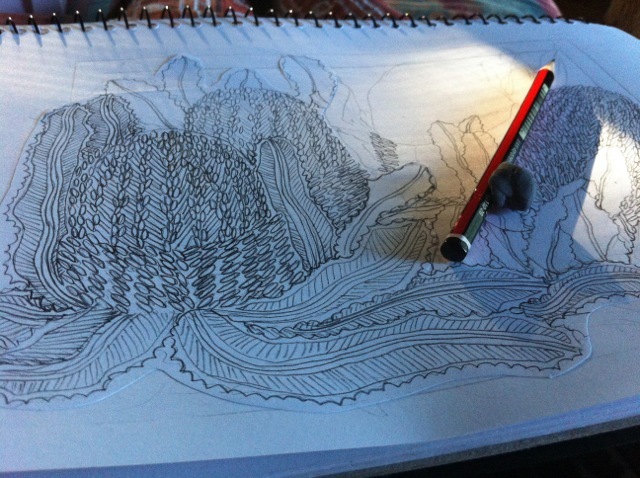 Basically I started with a drawing. Progress through using black felt marker pens and a white correction pen to create the finished design. 1. I enjoy the process of pencil on paper drawing – many other linocut artists work directly onto the lino but I love drawing and so I choose to do all my initial designing using pencil and paper. 2. I like to see the design taking shape using black felt marker markers and white correction pens so I can resolve the many design issues first rather than on the lino. 3. 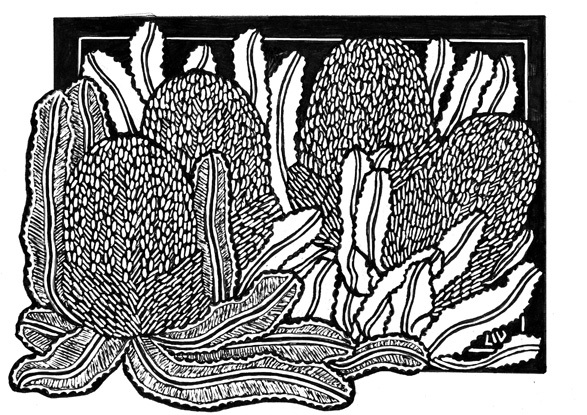 I have difficulty currently with carving the lino (due to shoulder issues) and the thought of carving and having to re-carve because of mistakes is not appealing given the pain that I often have carving. I was warned a long time ago about carpel tunnel syndrome for woodcut/linocut artists and have managed to avoid this problem but did not anticipate a ‘worn out’ shoulder. 4. I like to develop the ‘template’ I can reference when carving so I make less ‘mistakes’ of carving the wrong area out! Another method I sometime use when designing is to scan the final design or print and use photoshop to work around issues with design and colour. 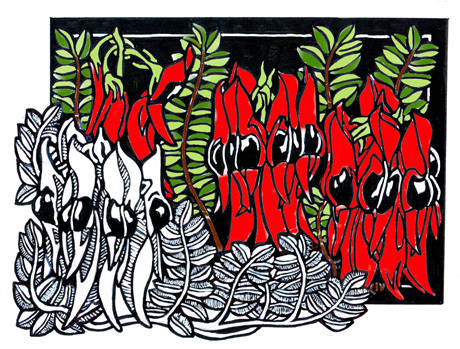 I used it for my ‘Regeneration’ linocut. 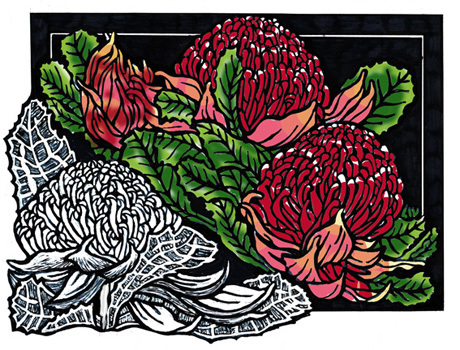 There is more information on this on my Linocut Tutorial website Handcolouring testing – ‘Regeneration’ – Waratahs Linocut Part 1 and Handcolouring testing – ‘Regeneration’ – Waratahs Linocut Part 2. 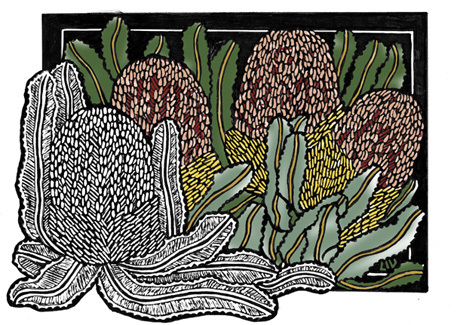 In this currrent ‘Postcards’ series I have developed 4 designs so far – Banksias, Waratahs, Lasiandras & Pendas and Sturt Desert Peas. I must say thankyou to Bronwen over at Snails Eye View for her tweet about Lasiandras & Pendas creating the inspiration of purple & yellow! I am still deciding on 2 more so it will be a set of six. Here are the roughly photoshopped coloured designs ready for carving. Oooh, another feast for the eyes! 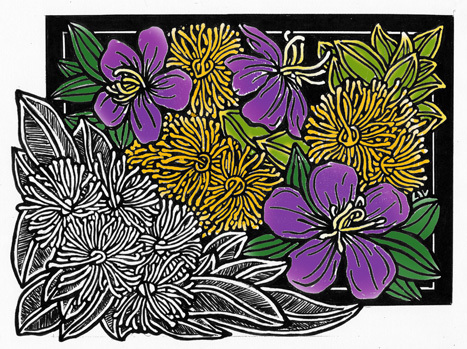 One day soon I’m going to follow the directions in your tutorial and give linocut another try. Your work is inspirational. Would love to see your foray into linocuts! Hope the tutorials help.